Amazing culinary adventures, royal palaces, stunning temples, feverish festivals, luxurious spas, green jungles and pristine beaches – Thailand has much to offer and warmly welcomes its guests with sunny smiles. During our cooking vacations in Thailand chefs reveal the secrets of favourite Thai dishes and introduce you to the fragrant herbs on your market tour. In our award-winning cooking school in Chiang Mai learn how to prepare Northern dishes. In Phuket, watch the fishing boats arrive with the catch of the day, cook a feast with our chefs and enjoy your meal with sand between your toes. On our food tours in Bangkok explore its tastiest street food known exclusively to locals. On our Vietnam culinary tours, eat your way through the country’s fragrant, exciting and healthy cuisine. Experience buzzing Ho Chi Minh City and Hanoi, two modern cities tempered by colonial architecture and tree-lined boulevards. Marvel at beautiful Halong Bay, crumbling temples, wood-paneled pagodas and rice fields of the Mekong Delta, and plunge into the glistening green of the South China Sea. Some of the country’s top food experts will take you on a culinary adventure, ensuring you get an authentic taste of culture and cuisine: sample aromatic Pho from Saigon street stalls or savour French croissants in a Hue patisserie, shop for fruit at the floating markets and take a cooking class in lantern-lit Hoi An. The aromatic essences, the exotic flavors and the abundant texture: there’s no culinary experience that compares to Thai cuisine. 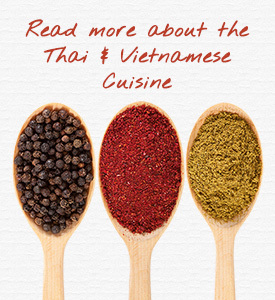 Thai cooking places emphasis on lightly prepared dishes with strong aromatic components. 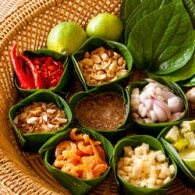 The spiciness of Thai cuisine is well known in the whole world. 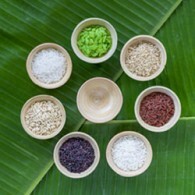 As with other Asian cuisines, balance, detail and variety are of great significance to Thai chefs. Thai cuisine encompasses four distinct regional variations: Northern, Northeastern, Central, and Southern and each region blends food derivations from adjacent countries. Southern Thai curries tend to include coconut milk and fresh turmeric that you can enjoy in a company of our star chef on a cooking tour in the beautiful surrounding of Thai Islands. You can discover the old temples and the royal palaces in Bangkok while making a delicious meal with our experts. You always dreamed about riding an elephant and finding rice fields in a stunning landscape of Chiang Mai in the North part of the country while trying out the local traditional dishes? We have a culinary tour only waiting for you! Many popular dishes eaten in Thailand originate in China, primarily because Chinese immigrants make up 10% of the Thai population overall. Obvious Chinese influences include the wok, not to mention techniques such as stir-frying, and the introduction of various forms of noodles. Discover a beautiful country with immense geographic and cultural diversity and very tasty, healthy kitchen! Traditional Vietnamese cooking is greatly admired for its fresh ingredients, minimal use of oil, and reliance on herbs and vegetables. With the balance between fresh herbs and meats and a selective use of spices to reach a fine taste, Vietnamese food is considered one of the healthiest cuisines worldwide. 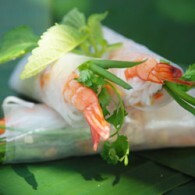 The Vietnamese cuisine’s favorite meats are fish, chicken, pork, beef, and various kinds of seafood. They also have a strong vegetarian tradition influenced by Buddhist values. Northern Vietnam’s colder climate limits the production and availability of spices. Black pepper is used in place of chilies as the most popular ingredient to produce spicy flavors. The abundance of spices produced by central Vietnam’s mountainous terrain makes this region’s cuisine notable for its spicy food, setting it apart from the other two other regions. The culinary tradition here features highly decorative and colorful food, reflecting the influence of ancient Vietnamese royal cuisine. Warm weather and fertile soils of southern Vietnam enable growing of a wide variety of fruits, vegetables, and livestock. As a result, foods in southern Vietnam are often vibrant and flavorful with liberal uses of garlic, shallots, and fresh herbs. Vast shorelines make seafood a staple in the diet of people in this region. 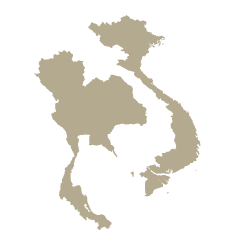 Southern Vietnam has also been the region where foreign influences – Chinese, Indian, French and Thai are most prominent.